Did you know that each year 1.3 million mothers go through a C-section surgery? And even after one year, up to 15 percent of mothers will still experience persistent pain following healing from their Caesarean procedure? No matter how you are planning on delivering your baby into this world, be it naturally through the birth canal or physically removed from your body, the experience is an arduous one. As if it were not enough that your body worked every second of the previous 9 months to create another human being, your body then endures great pressure and force to actually welcome your child into this world. So, of course, a certain degree of pain and discomfort can be expected following any surgical procedure. Caesarean section is not immune to this problem. In most cases, the pain is attributed to the body trying to heal injured tissues. This type of pain usually resolves after a few weeks. We all expect this to occur. In other instances, however, pain with surgery may not improve quickly or may develop weeks after the incisions are healed. This is not typical of a standard recovery, and should be discussed with your obstetrician or surgeon. This type of pain may be caused by damaged nerve endings in and around the surgical incisions. Whether you are an expecting mother or have already given birth to your new baby, we understand that experiencing constant pain after your C-section can certainly take you away from precious moments with your child. The good news is that we may be able to help you if you are struggling with constant pain after your Caesarean section. 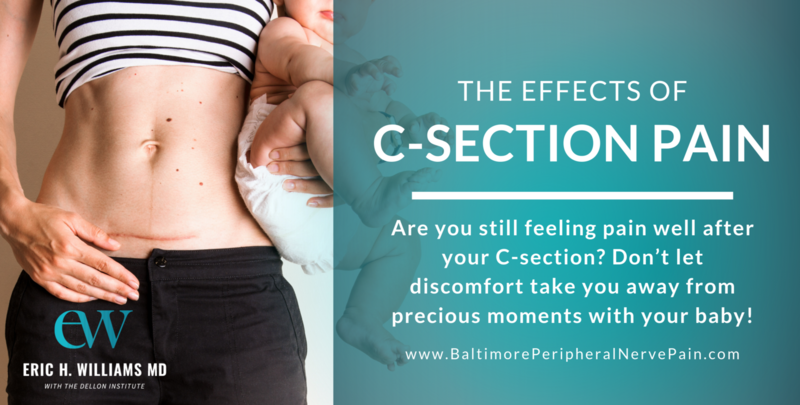 Keep reading our blog to find out what you may expect from a C-section, what may be abnormal, and what symptoms you should be on the lookout for. A Cesarean section, or C-section, is the alternative option to vaginal birth. In this type of delivery your baby is taken out through an incision made through the lower abdominal wall. Most women are awake during this procedure and able to hold their baby right away. The labor is not moving along as it should. The baby’s health is compromised. The mother’s health is compromised. The mother is carrying more than one baby. The baby’s size or position causes difficulties. Once the procedure is complete, it is normal for you to feel sick, weak, groggy and even itchy – these are all side effects of the anesthetics and should be expected. Normally, after a C-section you will stay in the hospital for 2-3 days. But all in all, the surgery is relatively safe for both you and your baby. Still, it is major procedure and with it comes its risks. Once you are discharged from the hospital you have approximately 6 weeks of recovering on your own at home. And, this is indeed a very fragile time in which your body returns to its pre-pregnant state. So, as your body regenerates, you can expect some cramping, constipation and discomfort. However, if your symptoms go beyond these general pains, you should first discuss this with your obstetrician. As with other surgical procedures, it is virtually impossible to perform a C-section without cutting into some nerves—especially those within the skin (Why do you think surgery hurts?). It is also possible to have nerves get stuck in the sutures used to close the abdominal wall, or become trapped in scar tissue during healing. Nerves do not have to be very big to cause a lot of pain. That being said, long-term neuropathic pain (chronic pain from injured nerves) after a C-section tends to be uncommon. Normally, nerves will heal without causing lasting issues, other than perhaps some numbness around the scar. Nerve pain does not necessarily imply that anything was done incorrectly during the surgery. Burning, shooting, stabbing, shocking and searing pain around the scar and in the groin or inner thigh. Pain from external stimulation that would otherwise not be painful, like water coming down from a showerhead or shaving. Numbness, burning, or tingling pain along the outer thigh, down to the knee. Tenderness on the sides of the abdomen. Pain that wraps around from your scar to your back. If you have had these symptoms for more than 6 months, the pain may be caused by nerve entrapment or nerve injury. We may be able to help. The lateral femoral cutaneous nerves. Dr. Eric Williams and his staff are equipped with the best tools to assess what type of nerve damage you may have suffered and which nerves in the abdominal wall or thigh may need to be addressed. We may be able to confirm your diagnosis with a nerve block performed in the office. This essentially means that we inject an anesthetic – typically lidocaine – around the nerve in order to cause temporary numbness. If there is both numbness and pain relief, then the diagnosis of a peripheral nerve injury can be confirmed. If there is numbness but no change in the pain, the cause is probably something else. Once the blocks have confirmed the diagnosis, Dr. Williams and his team will walk you through potential treatment options. An appropriate treatment plan will be developed for you. So, if you nerve pain is keeping you from enjoying motherhood, we are able to provide you with the care you need. For more information on this topic or to make an appointment at our Baltimore, MD office, just give us a call at (410) 709-3868. You can also fill out our handy request form online.